You will cry our heart out. 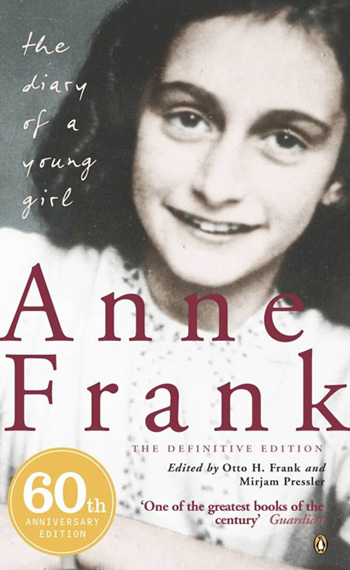 About 70 years ago, during the second World War and Hitler’s hate against Jews (and mankind), a young girl of age 13 (Anne Frank) went into hiding with her family. This book is her diary entries — her monologues & innermost thoughts. No matter what tangent of thoughts I follow; there is only one way to describe it — utterly human & beautiful. The diary entries start when she was living happily ever after, with her family, in Amsterdam. Then comes Hitler, his war and his hate against the Jews. Which forces them into hiding. And how everything changes for worse. There are times when I couldn’t believe that it was real. She started writing just before they went into hiding, she wrote things that were just perfect to resonate with a reader, she ended it on perfect note and sometimes she is too mature for a girl of her age. One can almost think that the whole thing is fabricated. But then it’s easy to follow: how she grew up to be that mature. And even though she is mature her childlike innocence are still preserved. Her inner struggles are just the one for her age — The struggle for self-identity, to be heard & taken seriously by the adults, the constant curiosity, etc. Although I’m only fourteen, I know quite well what I want, I know who is right and who is wrong. I have my opinions, my own ideas and principles, and although it may sound pretty mad from an adolescent, I feel more of a person than a child, I feel quite independent of anyone. Her aspiration to be a writer explain the perfect storytelling of her diary entries. It’s fascinating how a diary entry, in general, are written as if they’d be read by someone and yet they are never meant to be read. So no doubt it makes for a perfect & complete work in itself. The stark contrast of an innocent child in mids of a mindless war is the heart and soul of this book. What is it like to be in a war? What happens to your dreams? Your self? Your emotions? Values? Family? Society? Anne will take you there with her. She will show you that even in the darkest of her days, she kept her hopes alive. Till the very end. You will cry your heart out. But you will be as helpless as she was. Published on December 31, 2013. Updated on January 7, 2014.